I don’t usually write two blog entries this close together (see Friday’s prologue, 40 on 20), but yesterday turned out to be an epilogue to the epilogue. 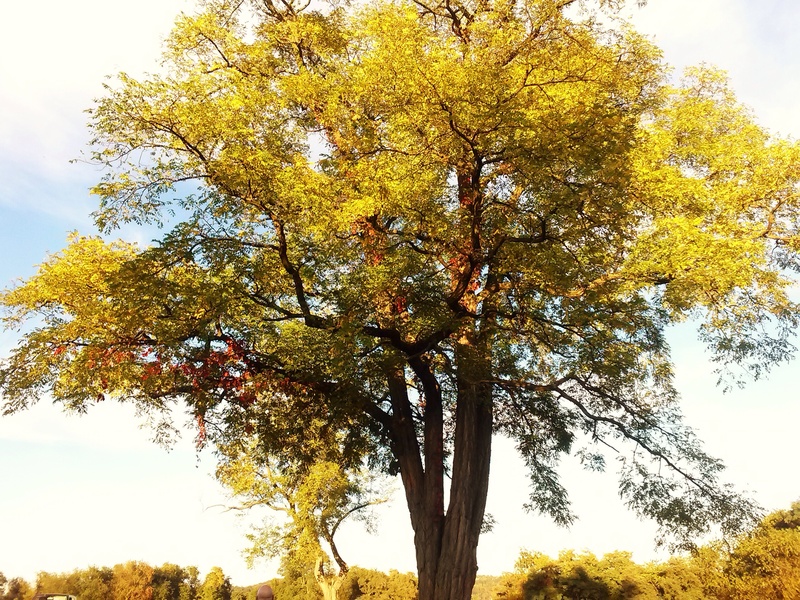 Her tree on the hillside. He kindly offered to meet me. I gently declined his offer. I was determined to find her grave on my own. I don’t go to the cemetery all that often. I have always felt that the presence of someone who was buried just simply no longer existed — in the ground quickly then out into the universe. But this being the 20th year, I felt compelled to commemorate. After about 45 minutes of searching, I was both laughing and grimacing at the frustration of not finding my mother’s grave. I walked to the spot where I was sure she was buried. “Do they move graves here? 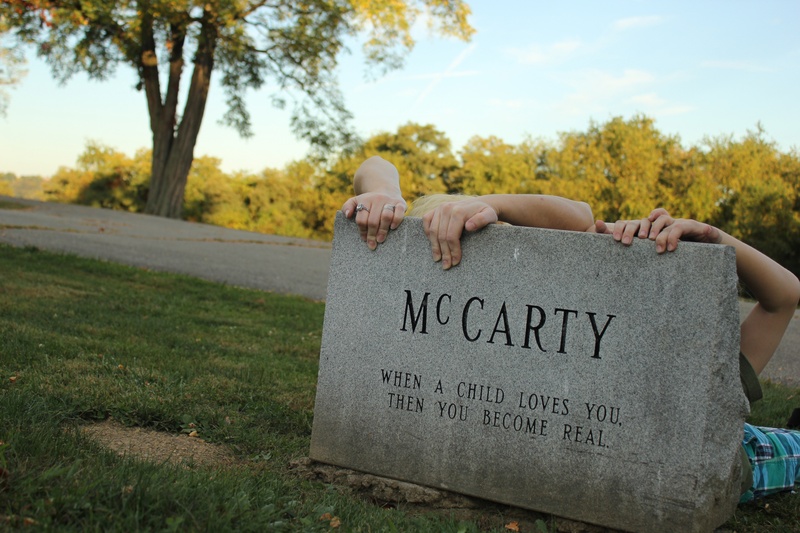 Maybe they moved her grave.” Jack was trying to lighten the situation. We were stressed. I was a little argumentative and tense. I got back in the car and said to Dave, “I think she is screwing with me. I know that she was buried near these damn trees!” There were far more explicatives in my rant than the few I am documenting here. We asked for directions. We got quick answers from mourners who really just wanted to mourn. Dave suggested one more turn. And there it was. The right cemetery on a road perpendicular to the road we were just on. My brother said to “look to the edges of the road and you will find her.” After a little walk, I came upon it. I sat down in front of her name and my family left me alone with my thoughts. I started to take photos of all the things around me. I wouldn’t look directly at her grave at first. I went to switch lenses and something made me stop busying myself with tasks. I started to cry. I didn’t expect to. I think the idea of a person frozen in time got to me. Jack wandered over next to me and sat down. He was curious about the tombstones around me. We talked about the various engravings and made a few lighthearted jokes. He was fascinated by a telephone etching on the stone behind my mother’s. 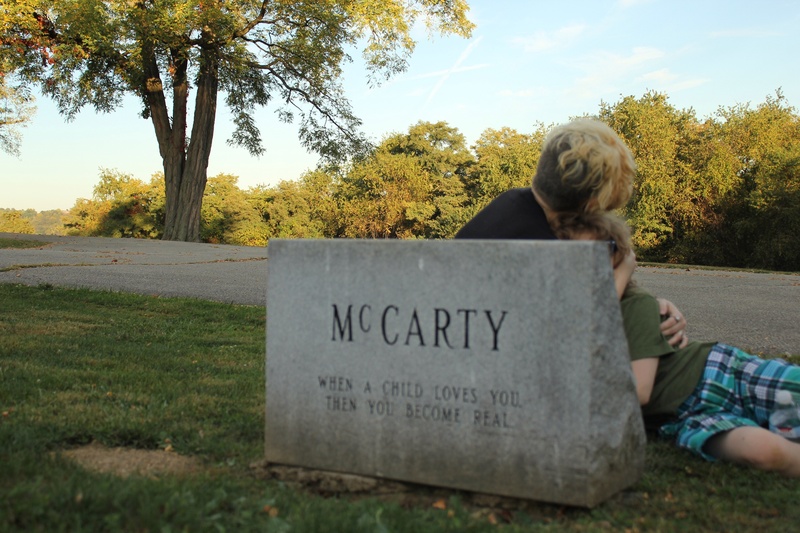 I left Jack and sat behind her stone and began to talk to Dave for a few moments. 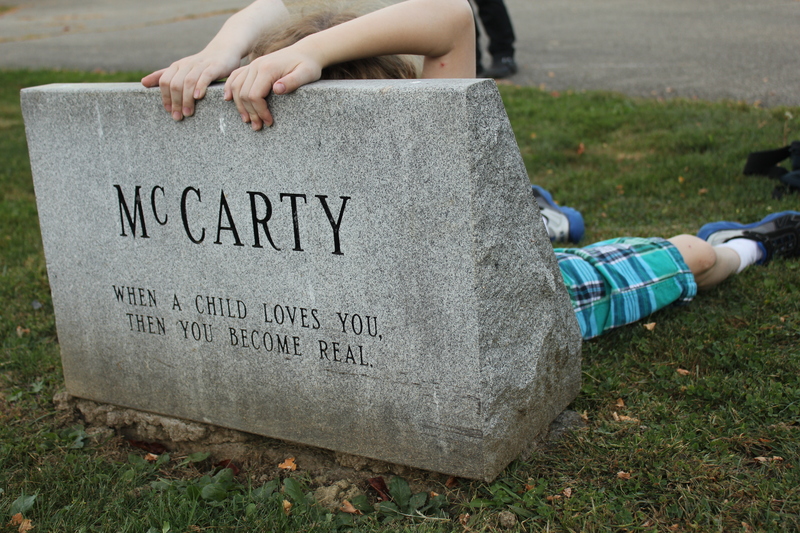 Jack laid down and rested his head on his grandmother’s tombstone. He was looking at nature and the tree in front of her, much resembling the way he watches “Spongebob” or some other random TV program. I harbor no illusion that he somehow felt some sort of deep bond with her in that moment. He never knew her, except through my stories and his questions. I think it was Jack just being Jack, a nine year old boy. I did say, “well, here is your grandma.” Without missing a beat, he yelled into the tombstone, “Hey, Grandma!!!!! !” It was more for a laugh than anything else. It made me smile. We don’t get to hear him say the word grandma all that often. I decided to lie down next to him, mimicking his pose. My Madonna moment, I thought. Dave snapped a picture. Jack and I chatted and laughed about the bird poop that might be in our hairs from lying on the less than pristine granite. I didn’t realize Dave was still taking photos when he captured our embrace. 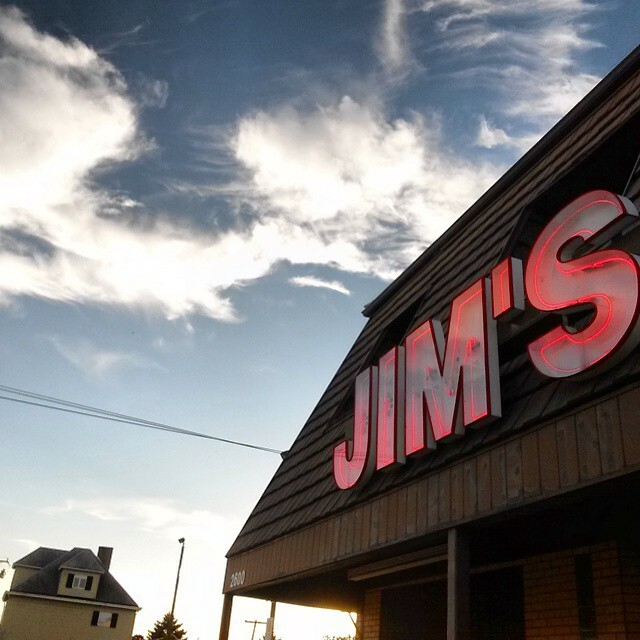 We went to Jim’s Drive-In. One of my favorite treats from when we were growing up. Burgers and dogs and homemade sauce. It didn’t taste exactly the same as I had remembered. We later drank some wine that had been saved from 1994. Table wine really doesn’t keep well. It tasted like Easter egg dye and salad dressing. So many things had changed. It was time to move forward. I asked my mom recently where my grandma Nunni was buried…she was vague, at best. I really want to visit the graves of all my grandparents, especially since all the stories of them come through my extended family, and not my parents. I feel like they think I am being nostalgic by wanting to know where they came from?? and am afraid to push. Maybe I shouldn’t be. Thanks for your post. It is wonderful. Thank you so much for reading. I so appreciate it. Your journey to and your past sounds complex and intricate. At least that is the sense I get from your comment. I get the need for wanting to know more. Or at least wanting to feel that there are touchstones. Good luck on your journey. I can’t wait to read all about it when and if you feel like sharing it with the world one day. Crazy how everything changes. Even the food that was maybe never all that good, was so wonderful when we were younger. I love this post. Thank you for sharing your mom, your son and your heart with the interwebs. Happy Mom’s Day, lovely lady. Thanks, my friend. I feel fortunate to have gained a lot of insight throughout all of this. I hope your day is wonderful and life is treating you well, xo.